After enjoying your time of ownership and most likely finally getting everything tuned up, dialed in and “perfect” there does come a day when it is time to sell your trawler. Life moves on, competing interests interfere, and things change. The reasons to contemplate selling your trawler are numerous. You may have hit the end of your allotted cruising window. Health changes to a loved one ashore or a member of the crew may force your alter your cruising plans. The important fact is that you have had the opportunity to go out and do some traveling and hopefully achieved some cruising goals. You have seen some of the world by waterfront transport and met some amazing people along the way. Selling your trawler is emotional, it has become a living part of your family and your investment in time, money and devotion make it a difficult choice to part ways. Price is the most important factor in selling your trawler, obviously any deal is going to be defined by the final sales number, but to make the sale in a timely fashion it’s really all driven by your asking price. You have to be as low as possible to attract attention. Buyers have too many choices and if your trawler price is perceived to be above the market they will not see through your strategy and come in with big hopes of negotiating a major deal, quite simply they will move on. Your “baby” is worth much more to you than it will fetch in the open market. When you list your boat for sale you must be prepared to walk away and need to think of your pride and joy as a number, a future (hopefully soon) deposit into your bank account, not a magnificent assemblage of fiberglass and wood that transported you to hidden coves. Make the commitment to sell, remove your personal items from the boat, clean, scrub and stage the boat to make it appealing in every facet and let your broker go to work. You can get a sense of what your boat is worth by adding up your receipts, but that is not going to equal what someone will pay. All boats depreciate, very few sellers make money so expect to take a loss, just don’t give it away. To keep things in perspective look back at your trawler ownership as an extended vacation on a vessel that you operated and cruised to the destinations of your choice. The money paid for the memories of unforgettable experiences and the value achieved was in the adventures enjoyed with family and friends. 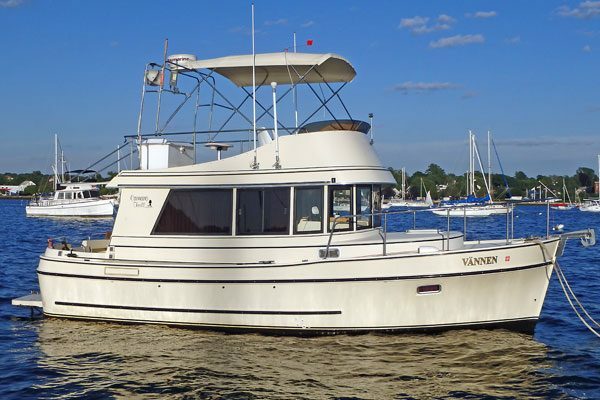 Most sellers can prove pure pride of ownership and present a clean, beautifully maintained trawler to the market. It’s time to move on –you need to let go of your boat and put your confidence into the broker you trust to help you find the next owner.